Transportation to and from your hotel to the departure point in George Town is not included. Please check with the dive shop for directions. Gratuities Not Included. The ex-USS Kittiwake was a Submarine Rescue vessel (ASR-13). She was part of the 6th Submarine squadron (SUBRON 6) home ported at the Destroyer-Submarine piers in Norfolk, VA.
She was built by Savannah Machine & Foundry Co. (Savanna, Georgia), awarded May 11, 1944 near the end of WWII, launched July 10, 1945 and commissioned July 18, 1946. The Kittiwake had an illustrious service for over 54 years, being decommissioned September 30, 1994. After being laid up by the US Navy for 6 years, the Kittiwake was transferred to the US Maritime Administration (MARAD) in March of 2000. From 2000 - 2009, she resided at the James River Reserve Fleet in Fort Eustis, Virginia (Norfolk area). MARAD issued an invitation to both US and International applicants to apply for the donation of a ship for the purposes of artificial reefing in 2004, and the Cayman Islands applied for a ship. The Cayman Islands was approved as the pilot project for the “donation of a ship from MARAD to a foreign Government for the purposes of artificial reefing”. The Kittiwake was transferred from MARAD to the Cayman Islands Government in August 2009 and was cleaned and remediated in Norfolk, Virginia to become an artificial reef. This included substantial work including the removal of all hazardous materials (like pcb's, asbestos, mercury, cabling, wires, oils, lubricants and a very long list). Additionally, all thin or loose materials that could break off during or soon after sinking were removed. The Kittiwake is possibly the 'cleanest' wreck even to be sunk as an artificial reef. December 17, 2010, the Kittiwake started her tow to Grand Cayman in a snow and ice storm; a tow that weathered rough winter seas for the better part of her 9 day journey, arriving in Grand Cayman midday on Dec 25, 2010. The 'America' tug boat brought her safely to Grand Cayman. The Kittiwake is 251 feet long, 44 feet on her beam, and drafted 19 feet fully loaded. Her light displacement was 1704 tons and full displacement was 2193 tons. After removal of much of the equipment and steel on board, her displacement is around 1800 tons of steel for sinking in the Cayman Islands. She is a very solid steel hull/steel superstructure that had 18 bulkheads, a single screw propeller made of solid brass that is still on board, and had a complement while in active duty of 10 Officers and 98 enlisted service personal. Her armament was removed before export from the USA. 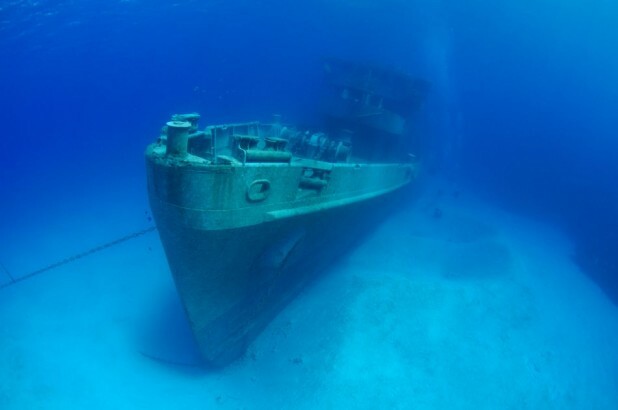 The Kittiwake was sank at the northern end of Seven Mile Beach, on the West or lee side of Grand Cayman at latitude 19 21.714’N and Longitude 081 24.073'W for her bow, just off of the Sand Chute Dive site. The bottom is flat and sandy. The Kittiwake rests 58 feet deep at the bottom and be only 10 feet from the surface, ideal for both divers and snorkelers. There are 5 decks on the 47 foot tall Kittiwake. Externally, the crow's nest, mast and large stern a-frame have been cut down and remounted to make her height suitable for Cayman waters. The upper decks accommodate the 2 bridges (both an external and internal bridge to allow operations in heavy seas) along with the radio and navigation room. The sonar has been removed. The Captain and XO's quarters are also located on the upper decks. On the main deck, from bow to stern, internally you will find the rec room, mess hall, ironing room, small tool workshop and recompression chambers. You will note the large a-frame structure on the stern that supported submarines and hard hat divers, as well as the diving bell where divers would enter to return to the ship from the ocean and then be placed in the chambers for decompression. Below the main deck, 2 decks exist that include the crews quarter, medic/hospital station, engine and propulsion rooms, air bank storage and compressors, as well as the steering gear, shaft, gyro, ammunition lockers, cold storage and barber shop to name a few areas. While the Kittiwake has been opened up with large access holes both vertically and horizontally, every space on the ship was used while in service. You can snorkel overhead and see the main decks and topography of the ship plus take a look down the smoke stack that opens up straight down to the bottom of the hull and the engine rooms. There is no end of rooms to explore this wreck, that will soon enough become an artificial reef, enhancing the marine environment with new fishery stock and habitats for marine life. The Kittiwake is situated in marine park that is protected under law in Cayman, with no touching or taking of anything, no gloves allowed and no fishing allowed on the wreck/Kittiwake site. It requires an entrance fee to visit from a licensed operator, with the fees going towards the ongoing maintenance and protection of the new artificial wreck/reef plus natural reefs. An exception to taking fish is made for culling lion fish, an invasive species to Cayman waters. The primary mission of the Kittiwake was to rescue sailors from downed submarines. She was very much a diving vessel. Many of her stories are still locked away as 'classified'. Over 50 years, she has many stories to tell, from submarine rescues to salvage operations recovering the black box from the Challenger disaster, rescuing a Haitian boat running P-250's non-stop, serving in the Caribbean including Bermuda, St. Thomas, St. Croix, Puerto Rico and Havana, Cuba to name a few stops, to Atlantic crossings to the North Sea, assisting the USS Orion, testing ballistic missiles, recovering dummy missiles from Polaris subs and helping out divers, to running interference for a Trident Submarine missile test (DASO) and almost sinking her from time to time..... she saw the world. From stories of the crew, there was great comradery and both rewarding and challenging voyages. All in all, the ex-crew are fond of her and say "to know her was to love her, and God bless the USS Kittiwake and those who served aboard her".